The AOC U3277PWQU offers a 31.5 inch 4K screen with excellent color reproduction and clarity without an extremely steep premium price tag. 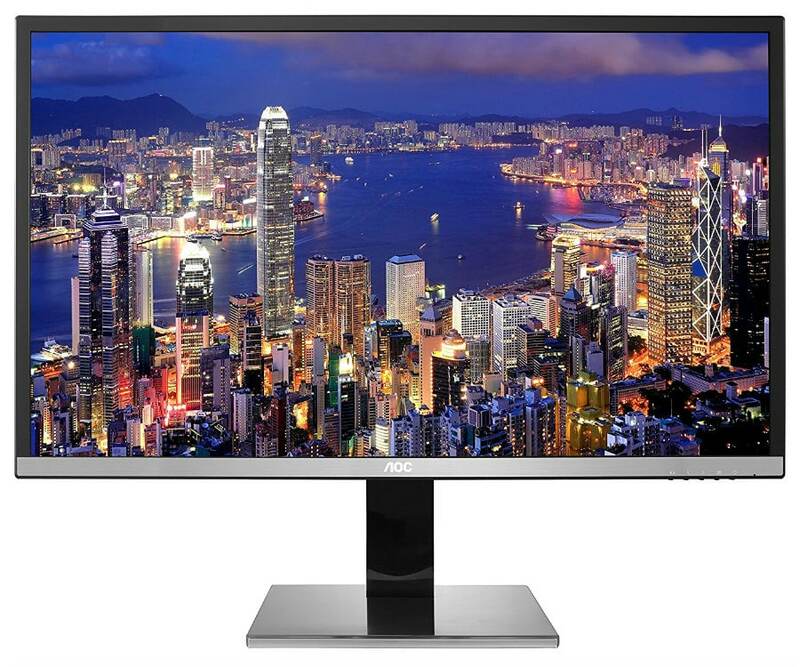 This 4K monitor uses a specialized VA panel that includes a 10-bit interface matched with a deep contrast ratio for extensive gamut coverage which makes it suitable for gaming and viewing pleasure. The AOC U3277PWQU offers specs at a price that looks too good to be true, making interesting to test and see how far your money goes regarding real-world performance. 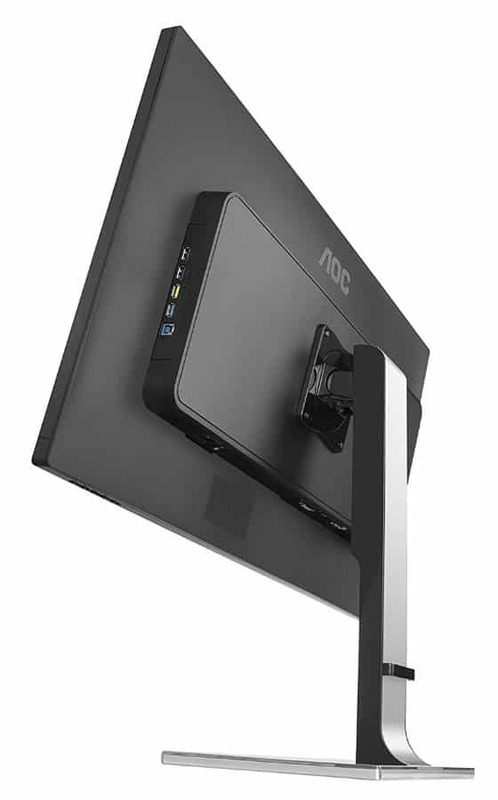 The AOC U3277PWQU utilizes a homey appeal that is suitable for most homes and offices with its piano black finish accented by brushed metal strips. The bezels aren’t as thin as we would like at 20mm each, although they still appear reasonable for a monitor of this size. What’s great, however, is that AOC managed to keep the proportions modest despite the screen’s size. There are OSD bottoms under the bottom bezel plus a power LED which glows blue when the monitor is in use and red when in standby mode. The rear panel of the chassis has a minimal bulge that is flat, making the AOC U3277PWQU suitable for wall or flush mounting. There is a convenience hub on the right side of this part with five USB slots which includes one for charging (yellow) and another for upstream (Type B). The I/O layout for the AOC U3277PWQU is relatively simple and only includes the necessary options for everyday use. The panel consists of DisplayPort 1.2, HDMI MHL, plus DVI-DL and VGA for signal inputs so almost every type of GPU is compatible even if some may not be suitable for 4K operation. There is also a pair of 3-watt speakers for fundamental audio appreciation, but we would still recommend getting a headset or a good speaker package for games and movies. The best physical attribute we love on the AOC U3277PWQU is its flexible stand which offers superb ergonomics for comfort and ease of use. You can tilt, swivel, pivot and even raise the height of the massive screen, so even the taller folk can enjoy this value monitor. This mechanism is covered in polished metal strips for a premium appeal, but we did notice a bit of wobbling which wasn’t exaggerated but kind of worrying for a 32-inch monitor. The AOC U3277PWQU utilizes a 31.5-inch VA panel by InnoLux which they call an AAS or Azimuthal Anchoring Switch LCD. This module features a 3840 x 2160 resolution, 60Hz refresh rate, and 4ms response time, plus 10-bit color support without dithering and a matte AG coating. A contrast ratio of 3000:1 and a maximum brightness of 350cd/m2 are also specified for deep blacks and vibrant colors. This model ships with a factory calibration report and a highly saturated image that has a slightly cool tint which in our opinion, is acceptable for most uses. The AOC U3277PWQU comes with decent color coverage which includes 90% of the Adobe RGB gamut with some skewing in greens. Selecting the sRGB preset sets a perfect 2.2 gamma curve, but it cuts out the extra vibrancy and sets sRGB coverage to 99%. These minor flaws may turn-off meticulous professionals since incorrect saturation levels may affect the color integrity of the media they are producing. However, the AOC U3277PWQU is fantastic at the accuracy with delta E averages of only 1.7 by default or 1.3 after calibration and contrast ratio reaching up to 2700:1 depending on brightness. We know AOC markets this model for professionals, but these scores and the actual appearance of the screen makes it more suitable for entertainment. Our test unit of the AOC U3277PWQU gave mixed results in color and brightness uniformity according to our colorimeter. There was a maximum variance of 25% in illumination towards the corners of the screen, while color uniformity did show a maximum Delta E of 3.5 from the universal D65 daylight standard. Anything below 3.0 is hardly noticeable for most users, especially since the screen is a bit larger than typical monitors. The brand did include a Uniformity setting which should correct these issues up to some degree, but the tool slightly worsened the results. There were minuscule effects on illumination levels across the quadrants, but the color uniformity’s maximum deviation rose to a Delta E of 5.0 which affected the integrity of the imaging output. We recommend leaving this setting off, although results may vary from unit to unit. This mix of capabilities rendered our Destiny 2 test admirably, with the deep contrasts and extra vibrancy working well with the title’s varying landscapes. The AOC U3277PWQU’s size is perfect for 4K gaming with objects and images appearing crisp and clean despite the lenient pixel density. The cinematic appeal of titles is better conveyed by larger monitors, although gamers should sit a bit further to prevent eye strain. Unfortunately, despite its merits for gaming, we couldn’t recommend the AOC U3277PWQU for anything more than casual gaming. For starters, you will need a potent GPU to be able to run high graphics settings smoothly, since you can’t rely on Adaptive-Sync to smoothen out stutters and tears. The slow pixel transitions of VA panels are also apparent in this model, with visible blurring and ghosting during fast-paced sequences. Input lag is also on the high-side with the AOC U3277PWQU clocking in at an average of 30ms in our tests. While this isn’t noticeable for some people, those who are used to fast gaming monitors will see the difference, with control inputs feeling a little sluggish. But for the weekend or after-hours gamer, this device and it’s easy to swallow price should be sufficient. The AOC U3277PWQU would have been a well-rounded monitor for gaming and professional endeavors if it weren’t for the mixed results which undermined the output quality of the screen. Casual gamers and office users shouldn’t be affected a lot by these issues, but these results will turn off the meticulous despite the enticing price. But on a positive note, the slight under-coverage can be corrected by a software-based solution to match the excellent accuracy of this model since its native gamut is comprehensive enough for complete sRGB representation. Users who want a 32-inch 4K monitor might want to check out other options, but will inevitably spend more for models that fare better than the AOC U3277PWQU. An example is the slightly more expensive BenQ PD3200U will cost at least $200 more, but imaging results including responsiveness and input lag are on a different level.